The translation was written for Tim Albery’s production of this vast opera which opened on 20th November 1993 at ENO. His designers were Hildegard Bechtler and Nicky Gillibrand; Mark Elder conducted. 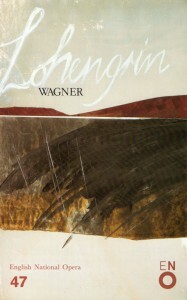 Lohengrin was sung by John Keyes and, when Keyes was indisposed, by Richard Berkeley-Steele; Linda McLeod sang Elsa. AH had been commissioned back in 1990 to write the text and it was excellent to spend plenty of time on it – too often there is too little space around the time alloted to writing what is effectively a new libretto, despite its compulsory faithfulness to the original. he looked so fair and wise. he will defend my name.